Hezekiah (or Ezekias) (Hebrew: חזקיה, "God has strengthened") was the thirteenth king of independent Judah in the Bible. The son of King Ahaz, who is portrayed in the narrative as a notorious idolatrer, Hezekiah reversed his father's policy and became an ardent monotheist who repressed Canaanite religion and attempted to centralize workshop of Yahweh in Jerusalem. He reigned 29 years and is praised by the biblical writers as one of the very best of the kings of Judah. In Christian tradition, Hezekiah is specifically mentioned in the genealogy of Jesus in the Gospel of Matthew. Biblical historian William F. Albright has dated Hezekiah's reign to 715-687 B.C.E. Hezekiah ruled the southern Kingdom of Judah during the conquest and forced resettlement of the northern Kingdom of Israel by Sargon of Assyria. Judah absorbed many refugees from the northern kingdom during Hezekiah's reign. Hezekiah then faced the conquest of nearly all of Judah except Jerusalem itself by Sargon's successor, Sennacherib. Hezekiah is particularly remembered for his monotheistic religious reform, which not only campaigned against idolatry but attempted to centralize the formal worship of Yahweh exclusively in the Temple of Jerusalem. At the end of his life, Hezekiah was cured of a life-threatening infection by the prophet Isaiah. 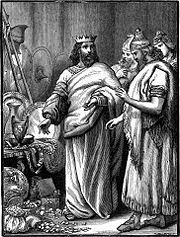 Later, he unwisely showed his treasure stores to visiting Babylonian diplomats, an act which the prophet condemned, predicting that Hezekiah's treasures and descendants would be taken to Babylon. His son, Manasseh, reverted to the idolatrous practices of Hezekiah's father. The account of this king in the Hebrew Bible is contained in 2 Kings 18-20, Isaiah 36-39, and 2 Chronicles 29-32. These sources portray him as a great and good king, following the example of his great-grandfather Uzziah. His first recorded act as king was to repair the Temple of Jerusalem, which had been closed during the idolatrous reign of of his father, Ahaz. He re-opened the Temple with impressive ceremony and sacrifices (2 Chron. 29:3-36). 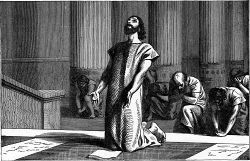 Hezekiah prays in the Temple. However, the remainder of the account paints a more mixed picture of Hezekiah's success. He is portrayed as victorious against the Philistines, but his decision to rebel against Assyria, whose vassal Judah had been, proves disastrous, as nearly the whole of Judah is captured. Also, near the end of his life, he foolishly shows his treasure stores to visiting ambassadors from Babylon, for which the prophet Isaiah harshly scolds him. The period of Hezekiah's reign witnessed the rise of Assyrian Empire as the dominant power in the region. In 722 B.C.E., the northern Kingdom of Israel fell to Assyria, which exiled large numbers of its people and replaced them with Assyrian populations. Many citizens of Israel also fled to Judah during this time. Hezekiah probably welcomed the refugees, as he had previously invited the citizens of Ephraim and Manasseh to celebrate Passover in Jerusalem. Perhaps believing himself invulnerable to the fate of Israel on account of his pious devotion to Yahweh, Hezekiah refused to pay the tribute enforced on his father. This led to Sennacherib's invasion, probably c. 701 B.C.E. : "In the fourteenth year of King Hezekiah's reign, Sennacherib king of Assyria attacked all the fortified cities of Judah and captured them" (2 Kings 18:13). who look for help to Pharaoh's protection, to Egypt's shade for refuge. Remnants of the broad wall of biblical Jerusalem, built during Hezekiah's days against Sennacherib's siege. Hezekiah anticipated the Assyrian invasion, and made at least one other major preparation. While he was unable to stop Sennacherib's capture of the walled cities outside the capital, he did take effective steps to stave off the Assyrian assault against Jerusalem. In an impressive engineering feat, a tunnel 533 meters long was dug in order to provide Jerusalem underground access to the waters of the Spring of Gihon, which lay outside the city. (The work is described in the Siloam Inscription. 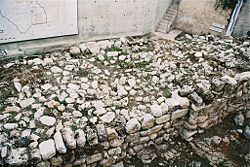 At the same time, a wall was built around the Pool of Siloam, into which the waters from the spring flowed (Isaiah 22:11). An impressive vestige of this structure is the broad wall in the Jewish Quarter of the Old City of Jerusalem. During the invasion, Sennacherib took the important walled city Lachish, and the siege of this city is recorded in an impressive monumental bas relief on view today at the British Museum. Sennacherib recorded on his own inscription how, in his campaign against Hezekiah ("Ha-za-qi-(i)a-ú"), he took 46 cities, and besieged Jerusalem ("Ur-sa-li-im-mu") with earthworks. (Hezekiah said:) "I have done wrong. Withdraw from me, and I will pay whatever you demand of me." The king of Assyria exacted from Hezekiah king of Judah three hundred talents of silver and thirty talents of gold. So Hezekiah gave him all the silver that was found in the temple of the Lord and in the treasuries of the royal palace. At this time Hezekiah king of Judah stripped off the gold with which he had covered the doors and doorposts of the temple of the Lord, and gave it to the king of Assyria.(18:14-16). In any event, the siege was eventually lifted. The Bible notes (Kings 19:9) that this happened soon after the Assyrians learned of an Egyptian force marching to Jerusalem's relief. By the way that he came he will return; he will not enter this city, declares :the Lord. As a result, the narrator of Kings reports: "That night the angel of the Lord went out, and smote in the camp of the Assyrians 185,000 men." While this report may seem fanciful to modern readers, it should be noted that the historian Herodotus claims that the Assyrians indeed withdrew from their campaign after having been visited by a plague of mice. One plausible explanation of these events is that the Assyrians, faced both illness and exhaustion from the extended campaign and also feared the approach of Judah's Egyptian allies, who were still fresh. Thus, the Assyrians accepted Hezekiah's tribute and withdrew without capturing Jerusalem. To the Assyrians, this was the logical course, while to the storytellers of Judah, it was a miracle of God. Since Isaiah had opposed Judah's alliance with Egypt, this factor would have been downplayed in pious accounts of the battle, while the role of God would be primary. In fact, the approach of Egypt's forces may have been decisive. The author of the Books of Kings (19:37) associated the Assyrian withdrawal event with Sennacherib's assassination by his sons Adrammelech and Sharezer. However, this actually happened 17 years later. The narrative of Hezekiah's sickness and miraculous recovery is found in 2 Kings 20, 2 Chronicles 32, and Isaiah 38. The accounts are in some respects identical, having apparently been copied from one source to another word for word. 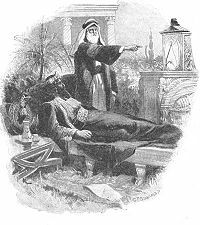 Isaiah prophesies to Hezekiah during the king's illness. Isaiah then cures Hezekiah by applying a poultice of figs to the infection. The story takes an unfortunate turn, however. Various ambassadors come to congratulate Hezekiah on his recovery, among them Merodach-baladan, the heir-apparent of Babylon (2 Chronicles 32:23; 2 Kings 20:12). Hezekiah not only welcomes the ambassadors, but shows them his treasures and storehouses. Isaiah sees this a terrible mistake, prophesying that "Everything in your palace... will be carried off to Babylon... And some of your descendants... will be taken away, and they will become eunuchs in the palace of the king of Babylon" (Isaiah 39:11). He reopened and repaired the Temple of Jerusalem. He centralized worship of Yahweh at Jerusalem, suppressing the shrines to him that had existed elsewhere in Judea (2 Kings 18:22). He abolished idol worship, which had resumed under his father's reign. He also destroyed the sacred pillars known as "asherim." As part of his campaign against idolatry, he also "broke into pieces the bronze serpent which Moses had made, for until that time the Israelites had been offering sacrifices to it" (2 Kings 18:4). He resumed the Passover pilgrimage and the tradition of inviting the scattered tribes of Israel to take part in a Passover festival (2 Chronicles 30). Of particular importance to the biblical assessment of Hezekiah was his willingness to destroy the high places. This not only removed a temptation to idolatry, but also forced the priests who served Yahweh at these local shrines either to move to Jerusalem or give up their livelihood. In addition, it brought valuable revenue to the Temple of Jerusalem in the form of sacrificial offerings and tithes that might otherwise be offered to local Levites or unauthorized priests. The bronze serpent of Moses, according to the Book of Numbers (ch. 20), was created at God's command by Moses after the Israelites had been bitten by "fiery serpents." God commanded Moses to fashion and uplift the image and have the people gaze up at it so that they might be healed. While this appears to have been a violation of the commandment against graven images, the remedy was effective. Apparently the serpent icon had been brought to Jerusalem, where it continued to be an object of adoration with supposed healing powers. Hezekiah's reforms attempted to do away with polytheism in his kingdom and represented the ascendancy of the "Yahweh only" party in Jerusalem, which had vied for power against other factions for centuries. Many Judeo-Christian readers believe Hezekiah's policy laid the foundation for the Jewish, Christian, and Islamic religions we know today. Hezekiah was succeeded on the throne by his young son Manasseh, then aged 2. Manasseh reversed the Yahweh-only policy of his father, allowing the high places to operate as before and honoring Baal as well as Yahweh. Like his grandfather Ahaz, he offered his son and also erected an Ashera pole in the Temple of Jerusalem. He was a ruthless ruler as well reportedly shedding much innocent blood. The biblical authors hold Manasseh responsible for God's ultimate rejection of Judah, which resulted in the kingdom being conquered by Babylon and taken into exile. So great was Manasseh's sin that even the most righteous King Josiah's policies—praised by the biblical writers as even better than Hezekiah's—could not set matters to right. Of Josiah the Bible says: "Neither before nor after Josiah was there a king like him who turned to the Lord as he did—with all his heart and with all his soul." But it adds: "Nevertheless, the Lord did not turn away from the heat of his fierce anger, which burned against Judah because of all that Manasseh had done to provoke him to anger" (2 Kings 23:25-26). Thus, the brief golden ages of monotheism in Judah initiated by Hezekiah and his great-grandson Josiah came to naught in the short run. However, these two kings instituted a tradition that later became the guiding force of post-exilic Judaism. Despite their intolerant policies that are inimicable to the modern principle of religious freedom, they can be seen as the royal forefathers of monotheism to whom the Abrhamic religions owe a great debt. 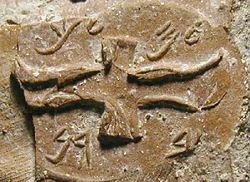 A 'LMK' seal, meaning "belonging to the king," from Hezekiah's time. Signet rings and other signing devices, some that may have belonged to Hezekiah himself, while others name his servants. These have been gleaned from the antiquities market and are therefore subject to frequent authentication disputes. Although it is generally agreed that he reigned in the late eight century B.C.E., there is considerable uncertainty about the precise dates of Hezekiah's reign. First, the Biblical records conflict, as they do for a number of rulers of Israel and Judah. 2 Kings 18:10 dates the fall of the northern capital of Samaria to the sixth year of Hezekiah's reign, which would make 728 B.C.E. the year of his accession. However, verse 13 of the same chapter states that Sennacherib invaded Judah in the fourteenth year of Hezekiah, and the Assyrian records leave little doubt that this invasion took place in 701 B.C.E., which would fix 715 B.C.E. as Hezekiah's initial year. Another set of calculations show it is probable that Hezekiah did not ascend the throne before 722 B.C.E. By Albright's calculations, the northern king Jehu's initial year is 842 B.C.E. ; and between it and Samaria's destruction the Books of Kings give the total number of the years the kings of Israel ruled as 143, while for the kings of Judah the number is 165. This discrepancy has been accounted for in various ways; but every one of those theories must allow that Hezekiah's first six years fell before 722 B.C.E. Nor is it clearly known how old Hezekiah was when called to the throne. although 2 Kings 18:2 states he was twenty-five years of age. His father (2 Kings 16:2) died at the age of 36; it is not likely that Ahaz at the age of eleven should have had a son. Hezekiah's own son Manasseh ascended the throne 29 years later, at the age of 12. This places his birth in the seventeenth year of his father's reign, or gives Hezekiah's age as 42, assuming he was 25 at his ascension. Some suggest that it is more probable that Ahaz was 21 or 25 when Hezekiah was born (thus, suggesting an error in the text), and that the latter was 32 at the birth of Manasseh. An alternative interpretation of Hezekiah's reign spans 727 B.C.E.-698 B.C.E. with Manasseh co-reigning for some years as a teenager. This attempts to harmonize the reference to Hezekiah reigning during the conquest of Samaria (2 Kings 18:9-10), and assumes the reference to Sennacherib's attack in 701 was either a second campaign or that the reference to it being in Hezekiah's fourteenth year is a corruption. ↑ Hezekiah's father reportedly sacrificed at least one of his other sons to the god Chemosh (2 Kings 16), an act that may have understandably caused Hezekiah to side with those who believed that Yahweh, a deity that abhored human sacrifice, was the true God. ↑ A similar assessment is given of Josiah, of whom it is said "Neither before nor after Josiah was there a king like him who turned to the Lord as he did—-with all his heart and with all his soul and with all his strength, in accordance with all the Law of Moses." (2 Kings 23:25) Josiah actually went farther than Hezekiah in his reforms, in that he destroy the northern shrine at Bethel—much detested by the authors of Kings and Chronicles—which no Judean king had previously attempted. ↑ Sennacharib, on the other hand, reports that he did build earthworks and towers against the city. Since Sennaracherib admits to withdrawing without taking the city, it is doubtful he would lie about this fact. It is possible that Isaiah's prophecy may have predated an aspect of the battle. ↑ The historicity of this account has been debated, in part because 2 Kings 22-23 attributes the first national celebration of Passover to Josiah, not Hezekiah. Albright: 715 B.C.E. – 687 B.C.E. Thiele: 716 B.C.E. – 687 B.C.E.